Hope you guys had an awesome weekend! 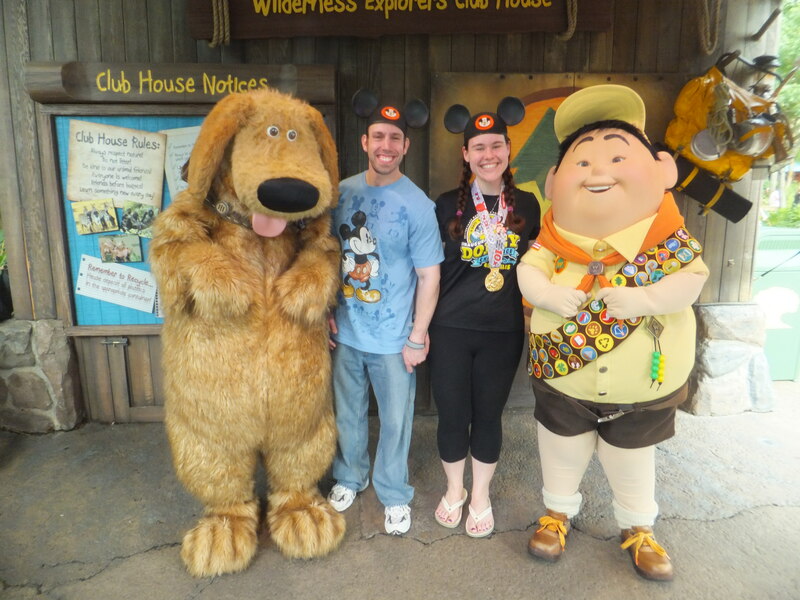 I thought I’d kick off the week with my recap on the Inaugural Walt Disney World 10K! If you missed my recaps on the expo or the 5K, you can find them here and here. After arriving at The World on Tuesday and spending three full days on my feet, I’m not gonna lie — my legs were already feeling sore. I also haven’t mentioned the weather for the weekend just yet — Friday morning was QUITE warm. It was FRIGID (30 degrees) the day we arrived, and then the temperatures started climbing again — and by the morning of the 10K, it was pretty freakin’ hot. 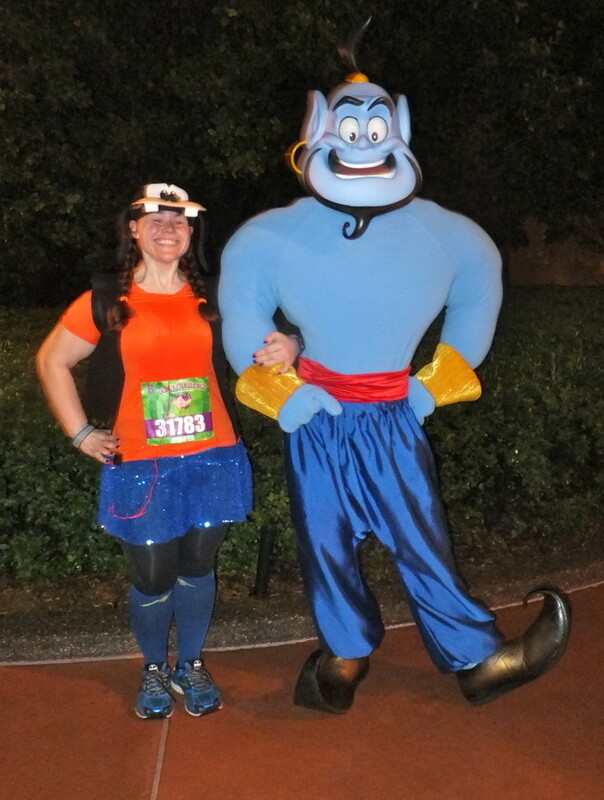 I woke up slightly later than I did the morning of the 5K, so I threw on my Goofy costume as quickly as I could. As I was leaving the resort, I realized I was forgetting one teensy little detail. My race bib! It was already about 20 minutes to 5, and the race started at 5:30, so I raced back to the room only to discover that the bib was nowhere to be found! We looked for it frantically and I could NOT find it anywhere! I’ll bet you can guess what comes next. Yep. I face-planted. My legs flew out from under me and I went down on my knees — HARD — and my chin slammed against the ground. For a moment, I panicked, thinking I broke a kneecap or really hurt myself. It was now almost 5 in the morning, so I was also panicked that I might not even make it to the start line! I picked myself up and my knees were sore and achy (and BRUISED) from the fall, but otherwise, I felt okay. I hopped in the car and drove as fast as I could to Epcot, making it into the parking lot as they were closing down the entrance! I then somehow squeezed into the corral area just as they were announcing the two-minute warning to get into your corral before they closed. I MADE IT! (Barely). Sadly, the actual race wasn’t nearly as eventful as my morning had been. The first few miles were pretty boring, with only a handful of characters. My knees were still hurting from my oh-so-graceful performance earlier that morning, but fortunately, they stopped bothering me about halfway through the race. The heat and humidity were also slowing me down; I was sweating like a pig by the first quarter mile. 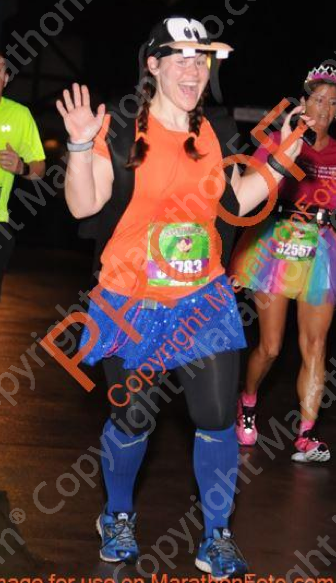 Of course, no matter what, it was a Disney race…so you know I was having a good time. 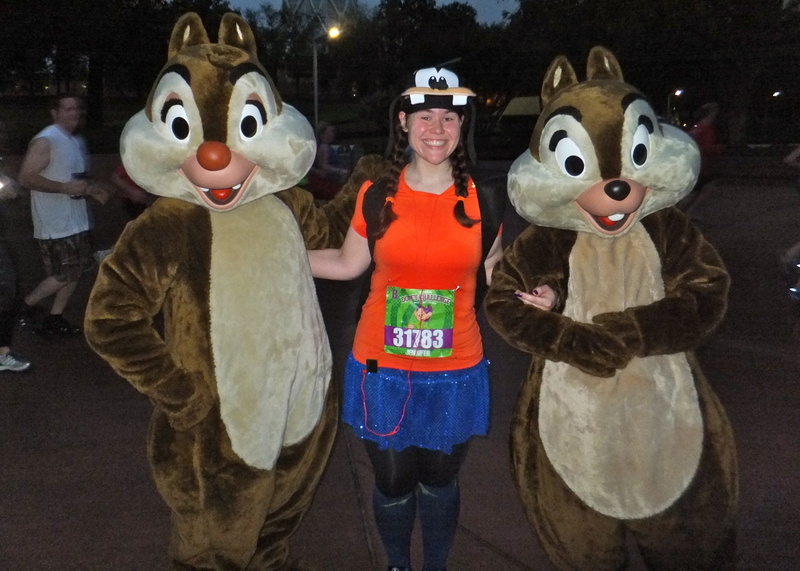 Overall, there were hardly any characters out at all, which was disappointing…and, a little surprising, since I ran the 10K in Disneyland over the summer and there seemed to be a character every half mile! Running around the World Showcase at Epcot is always fun, and the sights as we made our way onto the Boardwalk were beautiful. It was definitely a favorite part of the course for me! 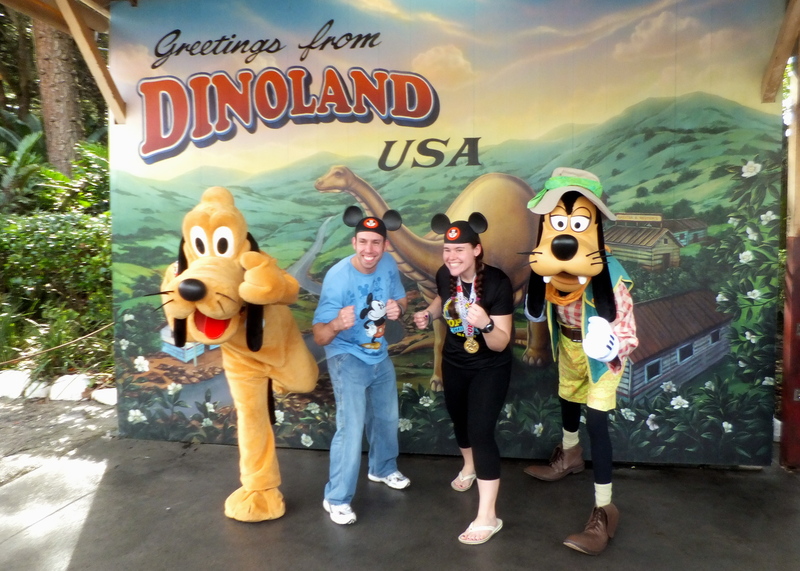 I still make a concentrated effort to keep my pace pretty slow to conserve energy for the weekend’s races, and of course I had to stop for a few character photo opportunities along the way. I was especially excited to see Goofy near ESPN! I also had to stop for Chip and Dale, who were out towards the end of the race. Before I knew it, we were headed towards the finish line, and the 10K was over. 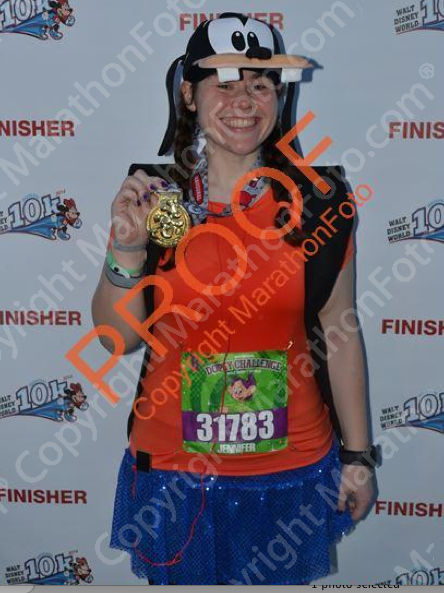 I finished around 1:30, which sounded about right for my character photo stops and slower overall pace. 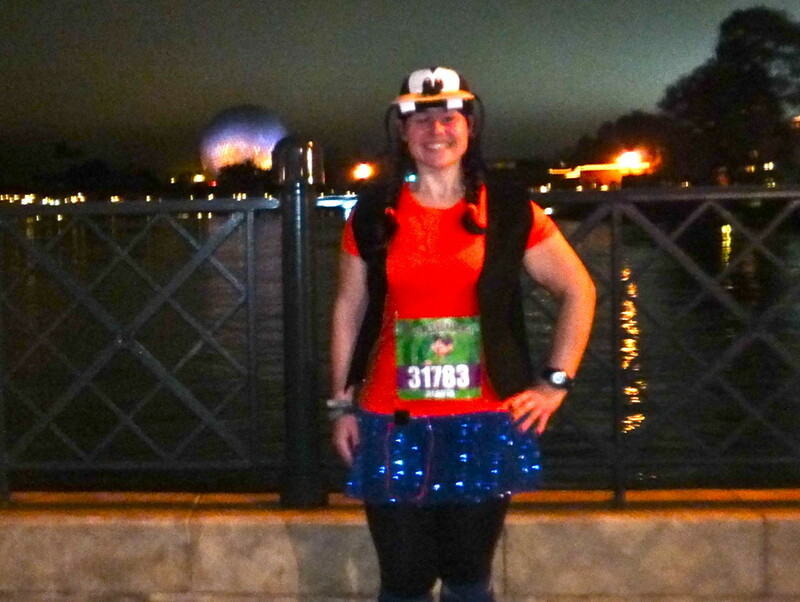 I was happy to be halfway through my Dopey Challenge journey — even though it was, technically, the “easy” part. 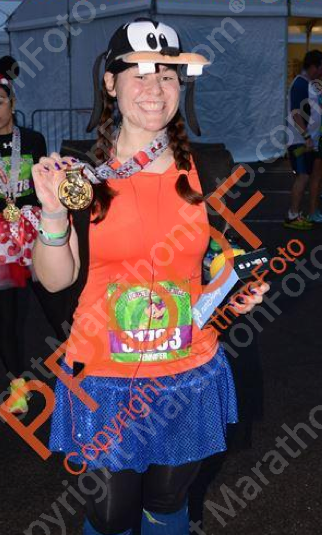 I collected my medal, and started to scarf down my box of snacks, courtesy of runDisney, for the second day in a row. And then, of course, I saw another insanely long character photo line for Minnie Mouse. 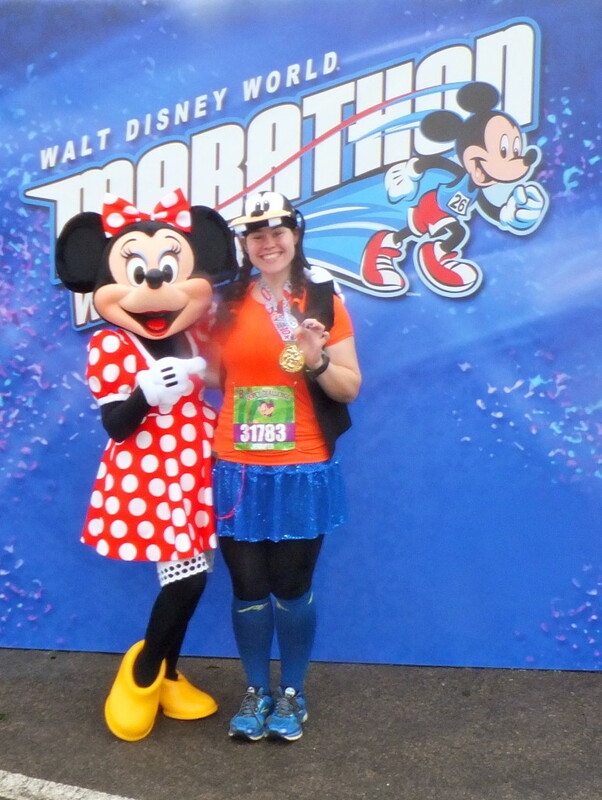 Since it was a Minnie Mouse-themed 10K, you know I couldn’t resist. 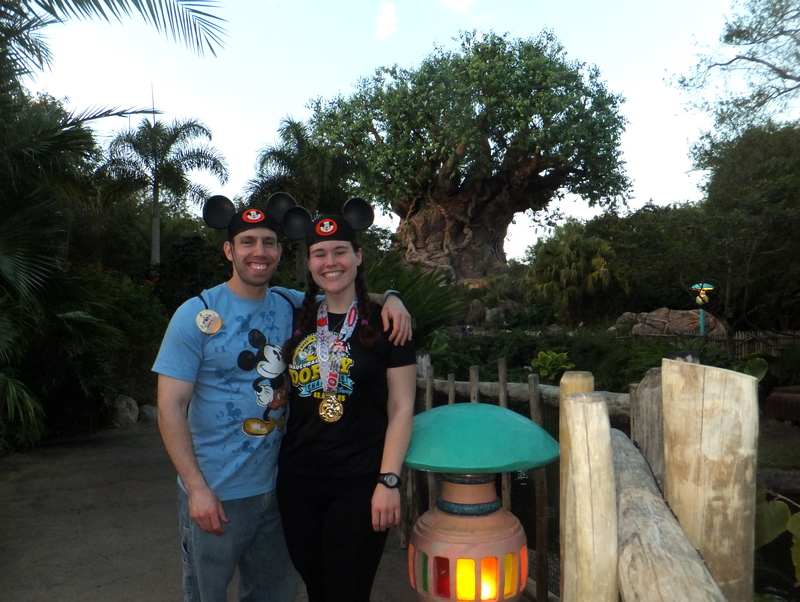 After I finally got my picture with Minnie Mouse, I headed back to the resort and Todd and I made our way to Animal Kingdom for the afternoon! We had a 4pm dinner at Tusker House and then headed back to the room for an early bedtime. I figured it was imperative to get as much sleep as possible the nights before the half and full marathon — I had no trouble at all passing out by 8:30. Oh my gosh (or should I saw gawrsh? ), that fall sounds painful! You aren’t the only one I’ve heard about falling during the 10k day – I’m so glad that you were able to continue to have a good time and a fun race. Love the outfit! It was! It was my own stupidity, though, so I can laugh about it (now, anyway, haha). It was definitely a fun race, no matter what! Oh my goodness. I would have been SO flustered with the way your day started! It was probably good that it was only the 10k and not the half or full and I am so glad to hear you weren’t hurt more…that could have been bad! Good to hear you had a good race though once you got to the starting line! Oh believe me, I was! 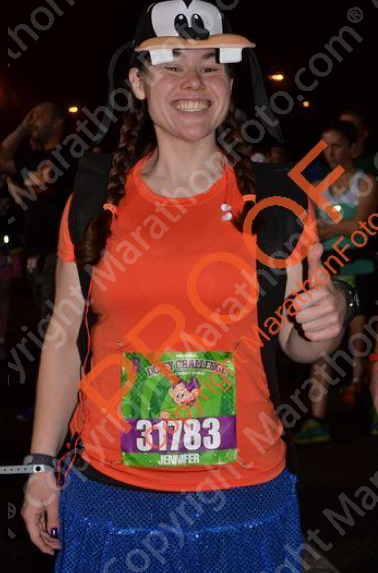 But like you said, thank goodness it was just the 10K…I made sure to leave myself PLENTY of time on those mornings, and laid everything out (including my bib) the night before, haha. Oh my gosh, I laughed (sorry!) at your morning. I would totally do something like that–lose my bib and then totally wipe out. Glad you were OK and could enjoy the race! Hahaha, don’t apologize! It was QUITE a morning — I swear, only me! All’s well that ends well, though, right? Yikes! At least you got there just in time and could run. YES! I literally made it JUST in time. Thank goodness! No bueno about the missing bib and fall! Glad it worked out. 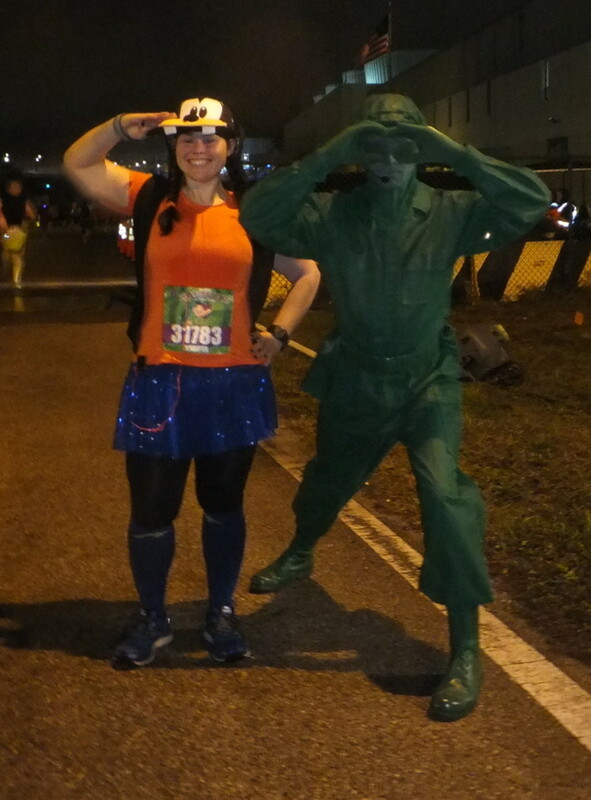 Love the Goofy costume! Haha, tell me about it! But…it’s all good! I’m so glad you didn’t hurt yourself too badly when you fell. Slipping on the wet ground is something that would happen to me too. I’m going to have to remember to pay attention the mornings of GSC next month! My word, what a morning! I hate the frantic race morning search for the thing you must have, and then to fall. Glad you made it to the race and through OK! Haha, yeah, it was definitely an eventful start to my day. Thank god I still made it on time, and didn’t seriously hurt myself. I can’t even imagine. Lesson learned, though, that’s for sure! 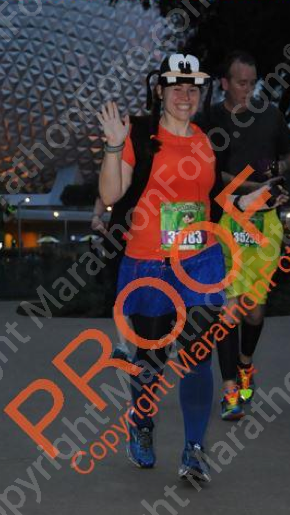 Wait, barely any photos ops for the 10K, but Dopey for the 5K? I’m surprised actually at that bit of info. 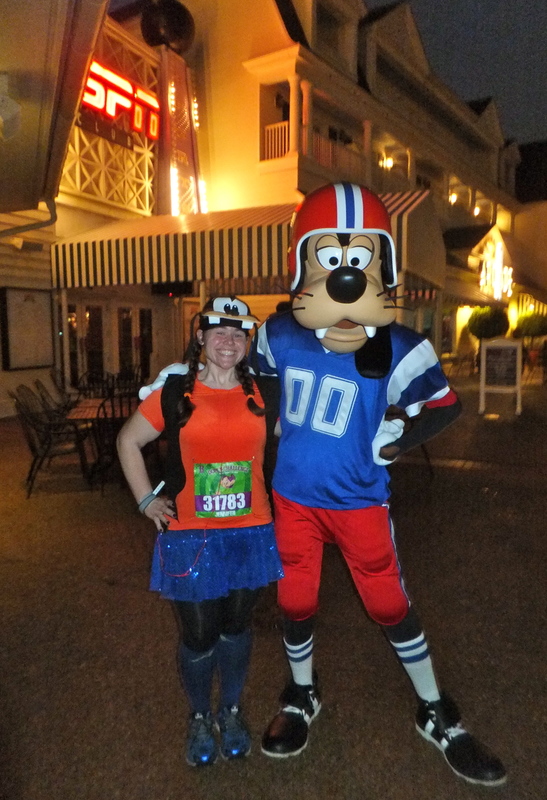 Love the sports Goofy though – no way I’d be able to pass up that photo ever! Regarding the first part of your story, it almost gave me a heart attack. I was like OMG please don’t say you miss the start!! That would have been terrible – glad you made it in time :0) As always, love all your pics! EXACTLY! It didn’t make a whole lot of sense.